If you may not handle with this Tutorial of backing up your Alcatel device and with this Tutorial to restore stock ROM on your Alcatel here's comes easy part of this. How to restore original Android ROM easily on any Alcatel One Touch Pixi3, Pixi3.5, Pixi4, Pixi5, Idol, Idol2, Spop, Mpop, Xpop, Star, Pop and others. So it might will work on any Android but may not work on some like Idol 3.
note: Before installing stock ROM make sure you've at least 30-50% of battery. Download Mobile Upgrade from http://www.alcatelonetouch.com ( and go to support and choose your model then download it). Install exe on your PC and open it up Mobile Upgrade! Window will appear and choose your model from the list. Power off completely your Alcatel. note: Make sure you've disabled Quick Boot or (Fast boot) from settings->accessiblity (may found on different place on each other model but Quick boot is on settings, if you don't find there hold power button and may there then uncheck. After choosing your model press START button. Then plug USB cable to your phone and PC. After that stock ROM for your model will be downloaded to your PC you need to wait some time until downloading finished! Finally it will ask you to dissconnect USB cable from Phone. On Alcatel screen press Upgrade Phone and plug USB cable again! 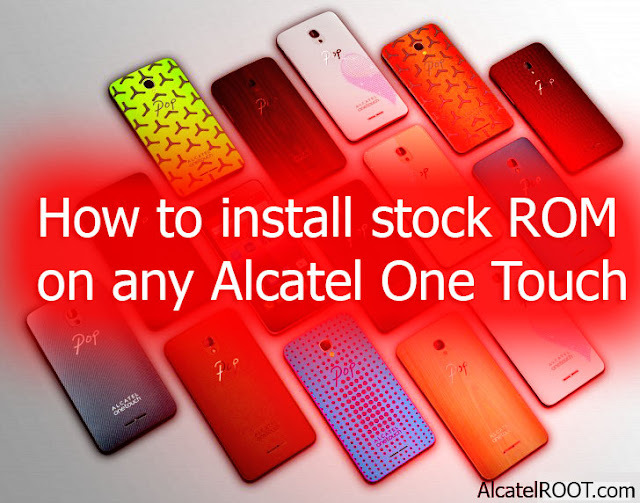 Once ROM successfully flashed into your Alcatel One Touch it will reboot automatically. And enjoy you will have a fresh Stock Android ROM on your Alcatel One Touch device! If this post not clear for you can see the Video tutorial of Flashing Stock ROM on Alcatel One Touch! If you not get success with this Mobile Upgrade tool on your Alcatel One Touch Idol, Pixi, POP and etc. In stock ROMs for Alcatel post you can found some of stock ROMs for most models of Alcatel One Touch Pixi3, Pixi3.5, Pixi4, Pixi4.5,Pixi5, Idol, Idol2, Idol3, Spop, Mpop, Xpop, Star, Hero.